San Francisco quarterback Colin Kaepernick was a three-sport star in high school and he was drafted by the Chicago Cubs. NEW ORLEANS — He is an athletic savant, the guy who can do anything on any field or court. In his senior year of high school, Colin Kaepernick was nominated for all-state in basketball, baseball, and football. That’s in California, where there are several good scholastic athletes. As a hoopster, Kaepernick scored 34 points in a state tournament playoff game. Baseball? He threw 92 miles per hour and was drafted by the Chicago Cubs. But he really loved football. So he went to the University of Nevada, where he ran the “Pistol Formation” and starred for the Wolf Pack of the Western Athletic Conference. 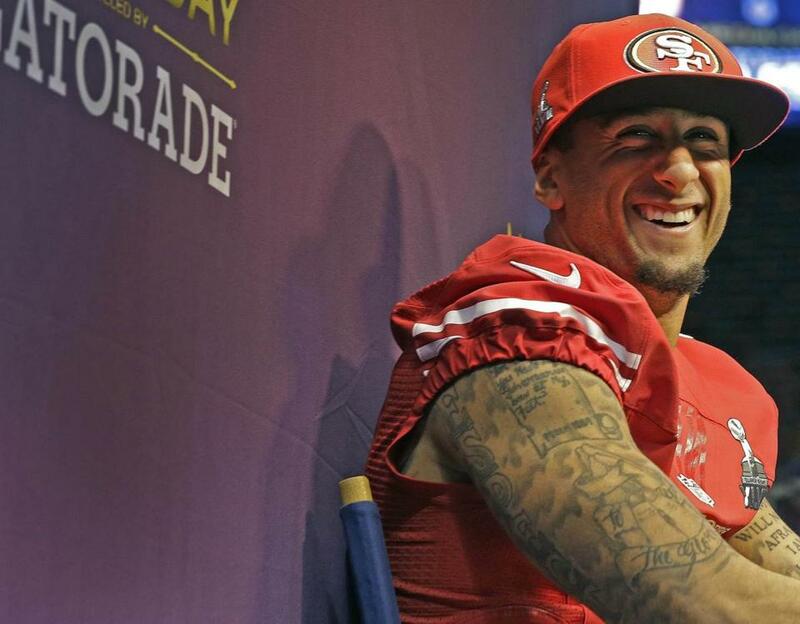 Kaepernick was a second-round draft pick (36th overall) in 2011 and didn’t start a game in the NFL until last Nov. 19. He has started only nine games. Sunday night, he will call the shots for the favored San Francisco 49ers against the Baltimore Ravens in Super Bowl XLVII. This makes him the rarest of rare — a Super Bowl quarterback who is a big mystery to most of mainstream America. A young man of mixed racial background, Kaepernick was adopted by parents in Milwaukee, moved with his family to Turlock, Calif., when he was 4 years old, and has always impressed coaches and fans with his speed and athleticism. He runs a 4.53 40 and throws a football more than 60 miles per hour. He also has more tattoos than Dennis Rodman. Most of his body art is taken from the Bible. Kaepernick’s baseball ability interests me most. With so few football offers on the table, it must have been tempting to sign with the Cubs out of high school. 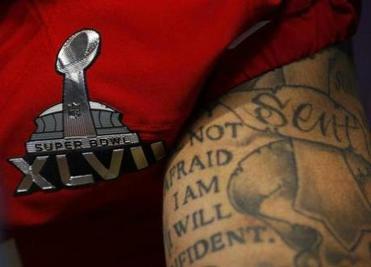 A look at one of Kaepernick’s tattooed arms. What about the third sport. Was basketball ever a possibility? Was there any sport that you had trouble with? Which one was the hardest for you? If I went up to hit against you, what would you throw? How would you start me off? I’m going to have a closed stance, leaning toward the plate a little bit. He rushed for 181 yards in the Niners’ playoff win against the Green Bay Packers. San Francisco coach Jim Harbaugh’s bold decision to replace starter Alex Smith (Smith took the Niners to the NFC Championship game last year) goes down as one of the great moves in the history of sports. This wasn’t like going with Tom Brady after Drew Bledsoe got hurt. This was a conscious choice to go with a guy with a higher ceiling. Kaepernick is not a verbal guy. Wearing his oversized Niners cap in flat-bill, rapper style, he looks like a kid you’d find in a skateboard park. He is humble, polite, and not given to public introspection. He demonstrated some sympathy for other adopted kids, particularly those who might not look much like their parents or siblings. And by late Sunday night, he might be one of the most famous athletes in the world. Colin Kaepernick is not the first quarterback to take over as a starter during the regular season and lead his team to the Super Bowl. Tom Brady replaced Drew Bledsoe, who was injured in Week 2, in 2001. Here are some notable examples of a backup reaching the title game after sitting out his team’s first five games of the season (Brady started Week 3). Four of the five went on to win the championship. Replaced Joe Gilliam, led Steelers to first of his four titles. Completed 9 of 14 passes against Vikings in Super Bowl. Led team to 4-1 record and a pair of road playoff wins. Threw for 212 yards, 1 interception in Super Bowl. Led Raiders to first Super Bowl win by a wild-card team. Named Super Bowl MVP, throwing for 261 yards, 3 TDs. Replaced Phil Simms (broken foot), played well in thrilling Super Bowl win, completing 20 of 32 passes for 222 yards. In only season with Ravens, took over for struggling Tony Banks and was efficient in Super Bowl rout (153 yards, 1 TD).